Respiratory care devices are used for diagnosis and treatment of respiratory diseases such as chronic obstructive pulmonary disease (COPD), asthma, tuberculosis, and pneumonia. These devices provide enhanced care to patients suffering from such acute and chronic respiratory diseases. Since the last decade, increase in prevalence of respiratory diseases is a pivotal factor that drives the respiratory care devices market. Anesthesia devices are used during surgical procedures to control pain, breathing, blood pressure, blood flow, and heart rate & rhythm. A medical state in patients induced by use of anesthesia leads to loss of sensation or awareness, which can include analgesia (relief from or prevention of pain), paralysis (muscle relaxation), amnesia (loss of memory), or unconsciousness. 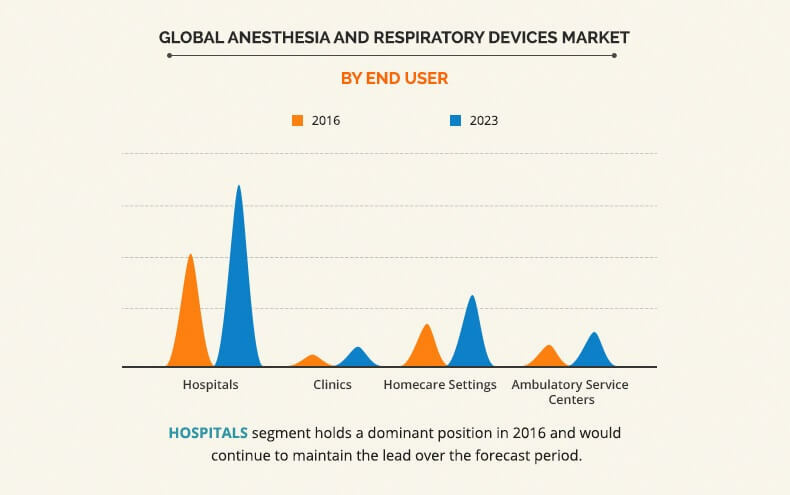 The global anesthesia and respiratory devices market was valued at $23,446 million in 2016, and is estimated to reach $38,298 million by 2023, registering a CAGR of 7.2% from 2017 to 2023. 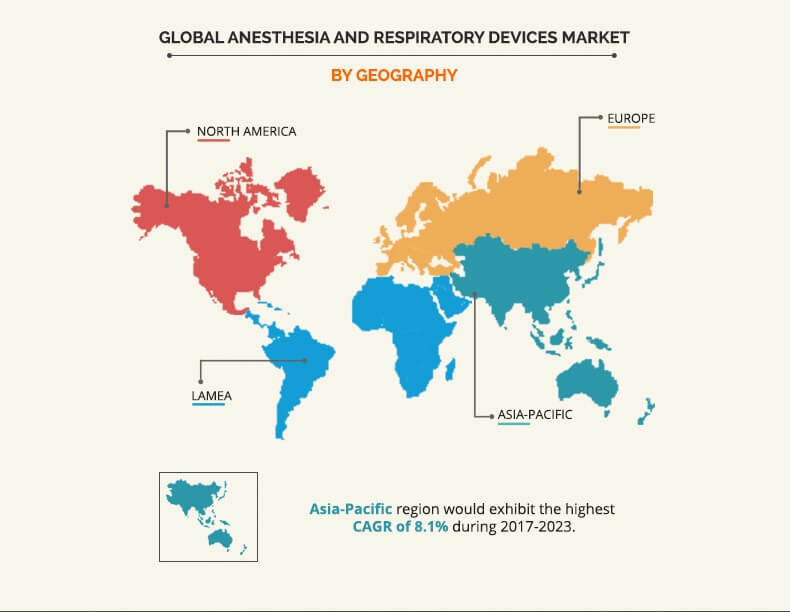 Increase in prevalence of respiratory diseases, rapid urbanization, upsurge in number of surgical procedures, rise in pollution level, growth in geriatric population, and increase in tobacco consumption drive the anesthesia and respiratory devices market. In addition, factors such as innovations with regard to respiratory care devices and governmental support for the launch and approval of these devices further fuel the market growth. Moreover, high demand for therapeutic devices for homecare settings and increase in healthcare expenditures are expected to provide lucrative growth opportunities for the market. However, the presence of a large pool of undiagnosed population, risks associated with certain therapeutic and diagnostic devices for neonates, and low adoption rate of new technologies, owing to reluctance from the physicians for treatment, restrain the market growth. Based on end user, the market is segmented into hospitals, ambulatory service centers, homecare, and clinics. The hospitals segment is the dominant segment, as they are equipped with specialized and advanced anesthesia and respiratory devices. However, clinics are expected to be grow at the highest CAGR. Based on region, the anesthesia and respiratory devices market is analyzed across North America, Europe, Asia-Pacific, and LAMEA. North America accounted for the largest market share in 2016, and is expected to retain its dominance throughout the forecast period. The key players operating in the global anesthesia and respiratory devices market include Teleflex Incorporated, SunMed, Smiths Group Plc., ResMed Inc., Medtronic Plc., Masimo Corporation, Koninklijke Philips N.V., Invacare Corporation, Hamilton Medical AG, GE Healthcare, Fisher & Paykel Healthcare Limited, Drägerwerk AG & Co. KGaA, Chart Industries Inc., Becton, Dickinson and Company, Ambu S/A, and 3M Company. Other prominent players in the value chain include Aircraft Medical, Verathon Inc., Karl Storz GmbH & Co. KG, Pentax, 3B Medical, Inc., Medline Industries Inc., Acare Technology Co., Ltd., Allied Healthcare Inc., Hill-Rom Holdings Inc., and Rotech Healthcare Inc. 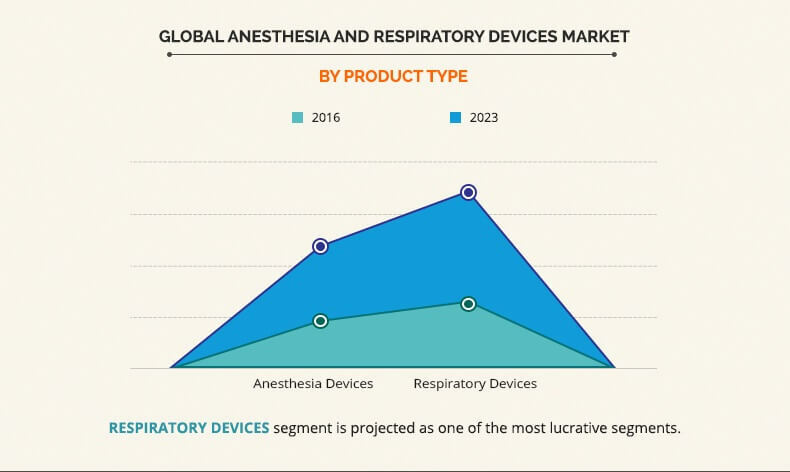 This report entails a detailed quantitative analysis of the current trends from 2016 to 2023 of the global anesthesia and respiratory devices market to identify the prevailing opportunities. The global market is comprehensively analyzed with respect to product, end user, and region. In-depth analysis based on geography helps in understanding the regional market to assist in strategic business planning. The market for respiratory care devices has witnessed a paradigm shift from use of stationary to portable devices. Increased adoption of portable devices is a significant trend in the industry. Technological advancements are prevalent in the market, which has led to rise in the number of product launches, due to which the market is estimated to grow at a high CAGR in the force future. The major factors that drive the market growth are surge in prevalence of respiratory diseases, rapid urbanization, rise in pollution level, growth in geriatric population, and increase in the number of outpatient surgeries. However, regulatory compliance, budget constraints, and lack of awareness in the developing regions could restrict the market growth. The use of respiratory care devices is highest in North America, particularly in the U.S., owing to the higher number of approvals and launches, followed by Europe and Asia-Pacific. In addition, the presence of well-developed healthcare infrastructure and high adoption of advanced technology are expected to help North America to dominate the market during the coming years. Although the use of anesthesia and respiratory devices system in Asia-Pacific and LAMEA is low as compared to developed regions, the adoption rate is expected to increase due to presence of a large patient population, increase in demand for therapeutic devices in the homecare setting, and increase in the number of outpatient surgeries. "Anesthesia and Respiratory Devices Market"